My favourite all matte eyeshadow palettes featuring Viseart, Kat Von D & more! Whilst I love a good shimmer eyeshadow, on a day to day basis it's matte shadows that I use most frequently. I find that I can achieved a polished look more quickly with mattes, although this was not always the case as I used to find that matte shadows were chalky/powdery and stiff. Fortunately, formulas have changed over the last few years and now mattes can be as buttery soft and easy to work with as shimmers and satins. 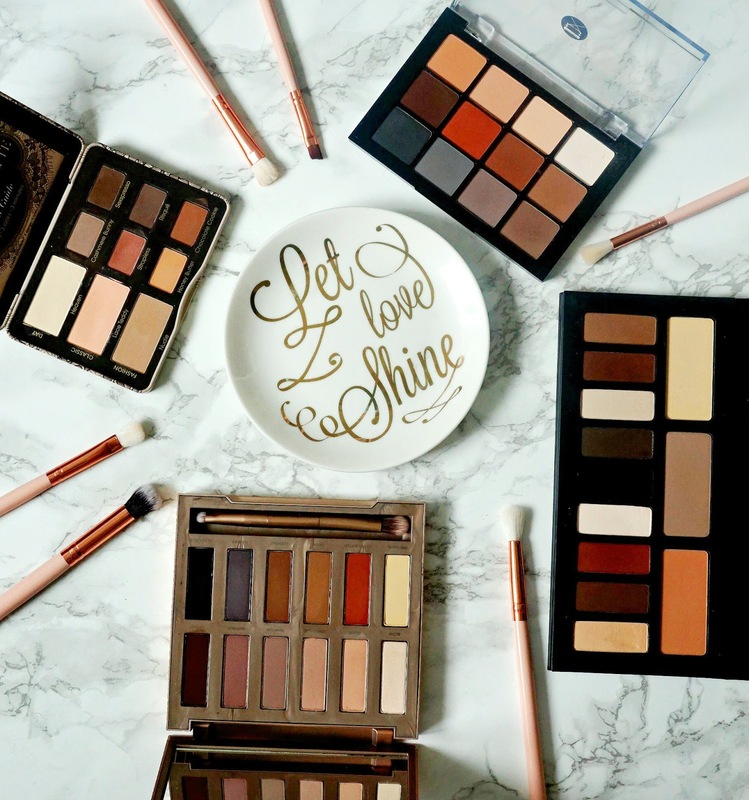 Today I am sharing my favourite all matte palettes - I have some really beautiful mattes in other palettes that also contain shimmers and satins but the four palettes here today are all matte so if you are on the hunt for the perfect palette, I hope that you will find something here. Kat Von D Shade & Light Eye Contour Palette: This palette contains twelve shadows and is divided into three quads: cool, neutral and warm. Each quad contains a base shade, which is the largest in size and contour, define and highlight shades. I personally find that I don't always stick with just one quad because the shadows complement each other well. The black is really pigmented so no matter what look I create, I can use that for a smudged lash line. Natural daytime right through to full on smokey looks can be created with this one palette. The pigmentation is second to none and there is not one dud in there. There can be a little kickback in the pan but once you tap your brush on the side of the palette, it is nothing too major. These shadows are so easy to apply and blend and the staying power is phenomenal. I always use a primer but these shadows look as fresh when being removed as when they are just applied, with no creasing or fading at all. The packaging is cardboard but very sturdy and comes with a large mirror inside the lid. There is also an insert with guides to creating a number of looks, which is an added bonus! I wish more palettes included these inserts. Overall, I absolutely love this palette and am never disappointed when I use it. Priced at £37/€46. Available in Debenhams. Too Faced Natural Eyes Neutral Eyeshadow Palette: This compact palette contains nine shadows and the layout is quite similar to the Kat Von D, as in there is one large base colour and then two smaller shadows, each in a cool, neutral and warm tone but again, they can all be mixed and matched. The texture of these shadows is slightly softer than the Kat Von D, but they also apply and blend very easily without any fallout. They are pigmented and long lasting so there is nothing not to love. The packaging is metal with a lace effect on the lid and a small mirror. This palette also comes with a guide on how to create three looks. It is quite pricey at £32/€38, compared to the Kat Von D palette, which is larger in size but this is perfect for travelling or in your handbag due to its size. Available in Debenhams. Viseart Neutral Matte Eye Palette 01: This is the most expensive of all four palettes in this post but I had to include it because I adore it. It contains twelve shadows varying from peaches to browns, grey and black. There are endless possibilities with this palette due to the variety of shades that all fall under the neutral spectrum. Some of the shadows give a little kickback in the pan but once you tap your brush on the side of the palette, it isn't an issue and it doesn't transfer into the shade next to it. The pigmentation with these is out of this world and the texture is soft and silky and they are a dream to blend. They don't fade, crease or break down at all. Really there is nothing not to love - well except maybe the price! At £59.95, this palette is not cheap but if you have hooded eyes (and you mainly use matte shadows) or just want to own only one matte palette, then this is the one for you. The packaging is functional (this is a pro MUA range), with a clear lid and a plastic, albeit sturdy, case. I am glad that I took the plunge and bought this palette. Available from Beauty Bay and Precious About Makeup. Urban Decay Naked Ultimate Eyeshadow Palette: This palette was kindly sent to me late last year from Debenhams. I had resisted buying it when it was initially released as I felt that it was quite similar to the Viseart palette and I couldn't justify the purchase, however when I received it I realised that there were shades in there that are different enough to justify owning both - Instinct, Lethal and Tempted, for example. The packaging on this palette is the most striking of all four mentioned here today - the rose gold, embossed lid is stunning. Inside the lid is a large mirror and there are twelve all new matte (although one has a slight shimmer) shadows and one double ended eyeshadow brush in the palette itself. The majority of the shadows are very pigmented and velvety in texture, which makes them easy to work with - the exceptions are Nudie and Tempted, both of which aren't awful but just not up to the same standard as the others or Urban Decay shadows in general. The variety of shadows in here means that it will work well on all skin tones because there are warm and cool tones available and there are endless possibilities with how many eye looks can be created for both day and night. At £39.50/€47.50, this is a great alternative to the Viseart palette. Available in Debenhams. All of these products are cruelty free and all are very high quality in terms of texture, pigmentation, blendability and staying power. It would be difficult for me to say which is my favourite as I love and wear all of them but I am aware that it isn't necessary to own four all matte palettes! Are you a fan of matte eyeshadows or do you prefer satins and shimmers? Do you have any recommendations for other matte shadows that I should try? I would love to hear your thoughts and recommendations in the comments below!